One of the main advantages of using fabric shower curtain liners is that they are machine washable for repeated use. 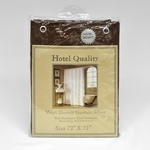 These standard size fabric shower liners wash well and dry quickly, so that each of your guest is welcomed with a clean and inviting shower liner upon arriving. 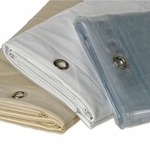 Water repellent, these tightly woven polyester fabric shower liners will keep water off of your bathroom floor and in the shower where it belongs. The 100% polyester fabric is also mold and mildew resistant to last longer between washes. The hook or grommet holes are stitch reinforced for added durability. The added reinforcement strengthens the shower liners for repeated machine washing and prevents the liners from tearing if they are pulled on. With the help of a weighted bottom hem, these fabric shower liners will hang straight and stay inside the shower or tub. 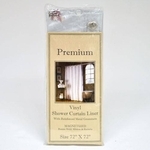 Purchase wholesale by the bulk case of 12 standard size fabric shower curtain liners with Free Shipping. These standard size shower liners are 70 inches wide by 72 inches long to fit standard shower or bath tub openings. Choose from 12 colors to match any bathroom decor (images of colors shown above in the following order): White, Ivory, Linen, Light Blue, Spa Blue, Brown, Black, Burgundy, Rose, Sage, Tangerine and Spice. Fabric Shower Liners - machine wash and dry for repeated use. 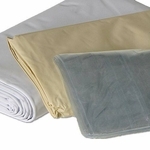 100% polyester fabric - resist mold and mildew, water repellent to keep water in the shower. Weighted Bottom Hem - helps shower liners hang straight and stay in place inside of the tub / shower. 12 grommet holes for hanging on shower hooks - Reinforced holes for long lasting durability. Available in 12 colors (colors shown in above images are in the following order): White, Ivory, Linen, Light Blue, Spa Blue, Brown, Black, Burgundy, Rose, Sage, Tangerine and Spice.